In my many years of working as a DBA, I have encountered many disabled logins. However, I have never really encountered what looks to be a disabled database user account. 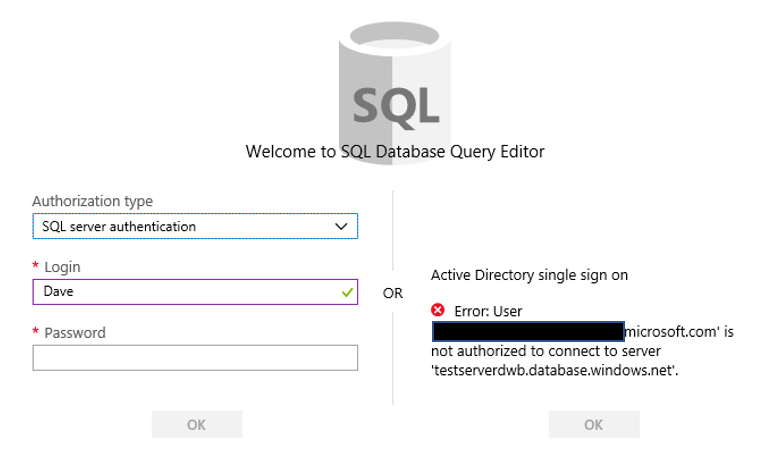 I didn’t even think it was possible to disable a user account in a SQL Server database. I checked the user account properties just to makes sure I was correct. Sure enough, no option to disable a user account. This finally turned out to be a simple case of looks can be deceiving. 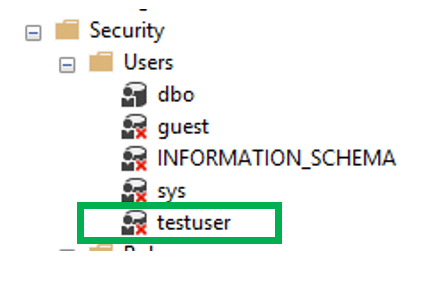 For the purpose of this blog, we will be using a SQL login named, testuser. My first thought was maybe a permissions issue. I very quickly realized that it was something else. The first thing I did was look at the properties of the login. This clearly showed that the login had access to a few databases, except the one related to the reported error, 1GBDB. As you can see below, it looks like the login doesn’t have access into the database. However, if you look at the users in the database, you can see that the account does indeed exist in the database. As you can see below. Of course the red “x” on the user account was a bit suspicious, we will get into that in a bit. One of the items I checked was if we have an orphaned account. So I check the SIDs for the login and the user account using these queries. As you can see, the SIDs for both the user account and the login are the same. So that rules out an orphaned account. I still couldn’t figure out why they user couldn’t get into the database. That red ‘x” was still bothering me. After some checking, I discovered there was something different about the user account in this database, 1GBDB, when compared to the same user accounts in different databases. 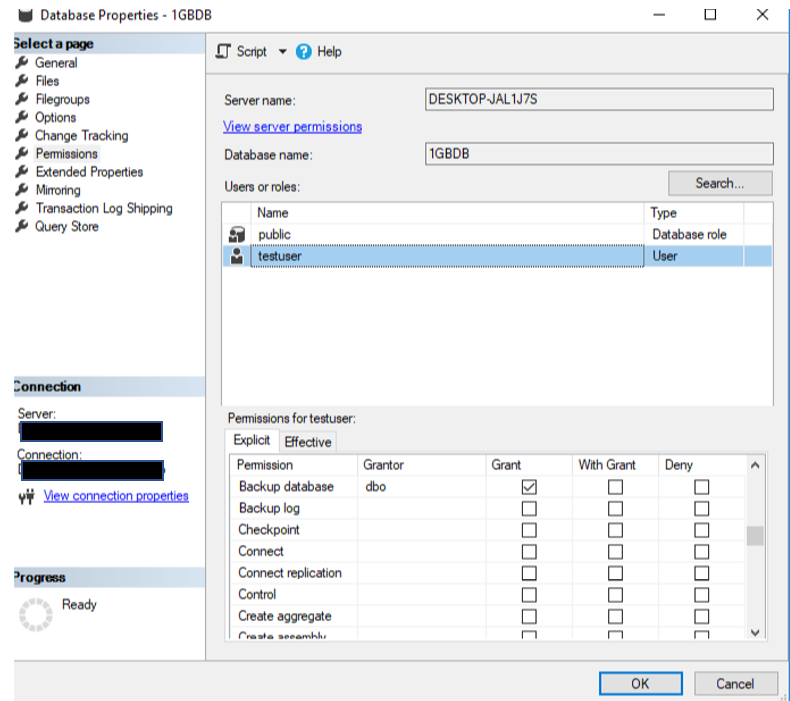 Database Permission properties for the 1GBDB, which the user cannot connect to. 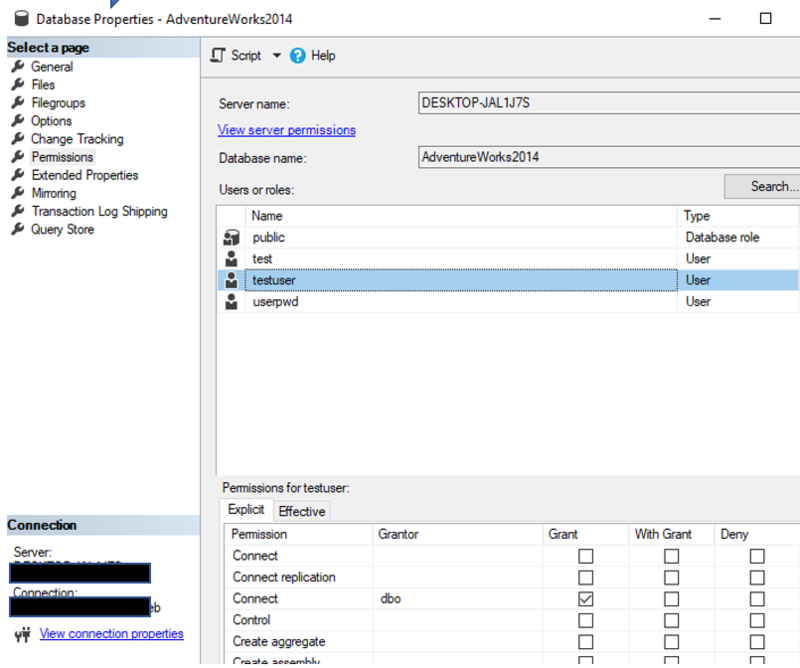 This the a screenshot of the database permissions for the AdventureWorks2014 database, which the user can get to. There is one important difference, the Connect permissions. If you remove the “Connect” permissions from a user account in a database that has a corresponding login, you will see this. Once you grant the Connect permissions for the user account, the red “x” goes away and all should be good. Unless of course there are other issues. Thanks for stopping by and I hope you learned something! 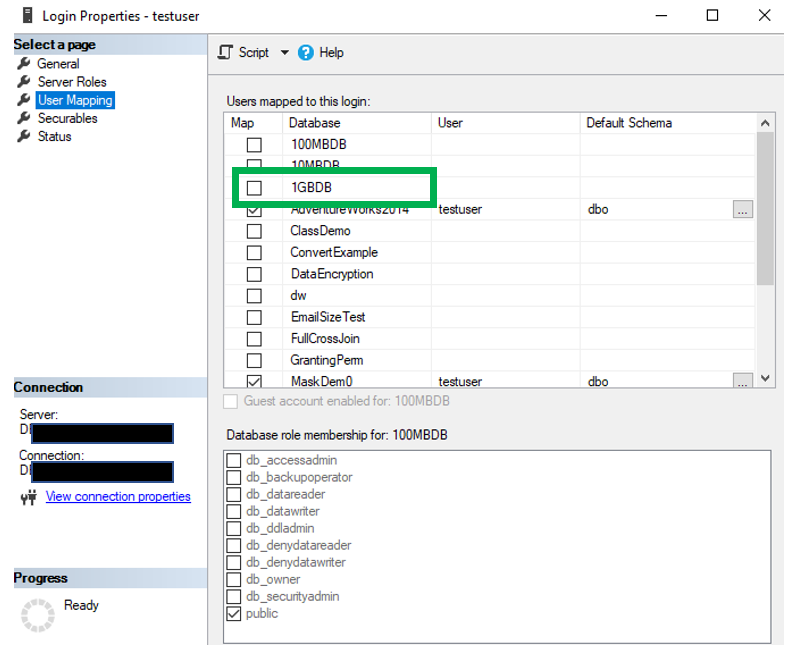 We have all been using SQL Server Management Studio to query and manipulate data, even for an Azure SQL database. 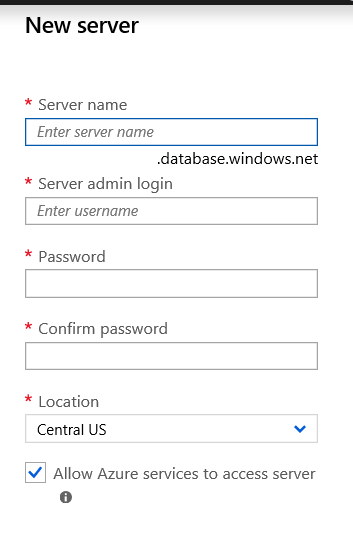 There is also an option to do this same thing built into the SQL Azure database interface in the Azure portal. Although there have been a number of posts related to this topic dating back a few years, this feature is still marked as “preview” in the Azure portal. Once you are in the SQL Database list in the portal, find the database you would like to work with and click it. When you do, you will be taken to the administration page for the database. On the left side you will see the “Query editor” link. You will also notice that this is a feature that is still considered to be in preview. When I did a Google search on the Query editor in the Azure portal, I found posts from as far back as 2017. Despite that, I still wanted to complete a blog post on it. Once you click it, you will be taken to a login page similar to below. Notice on the right side there is the ability to utilize the Active Directory single sign on functionality, which I do not have. On the left you will enter the appropriate credentials to login to the database. Once you are in the Query editor, you will notice many of the same features as SSMS. Below you will find a screenshot of the Query editor interface. Starting with the menu bar across the top, you will find the expected buttons. In addition to the Open query, new query and save query buttons, there is also an Edit Data(Preview) button. This does as you expect it might, allows you to edit the data. Just like the Query editor, this is also a preview feature. There is also a Login button if you wish to use a different user. 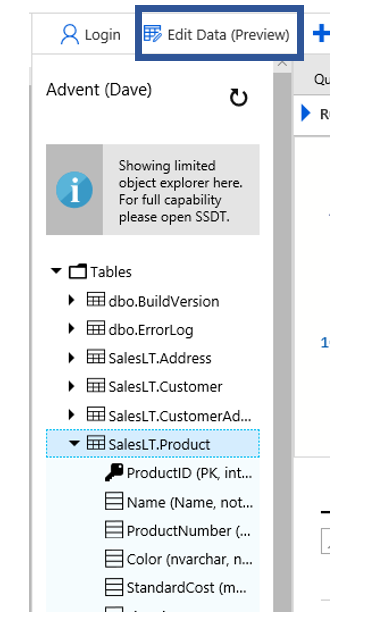 The Object explorer is very similar as that in SSMS, however there are some very glaring differences, mostly that there are fewer object types displays in Query editor. 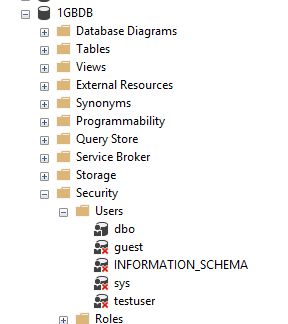 As you can see you can browse tables, views and stored procedures. As for the tables, you can see the column names and data types as well. 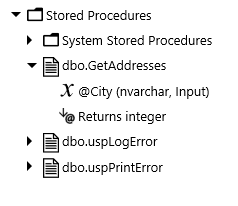 For stored procedures, you are able to see the parameters just as the image below indicates. In SSMS a user can right click on a stored procedure and execute it. In the Azure query editor, when you right click on an object you get nothing. The context menu does not appear, therefore not allowing you to execute the procedure. Of course you can still use T-SQL to execute a stored procedure. In many aspects the query window is very similar to that of SSMS. 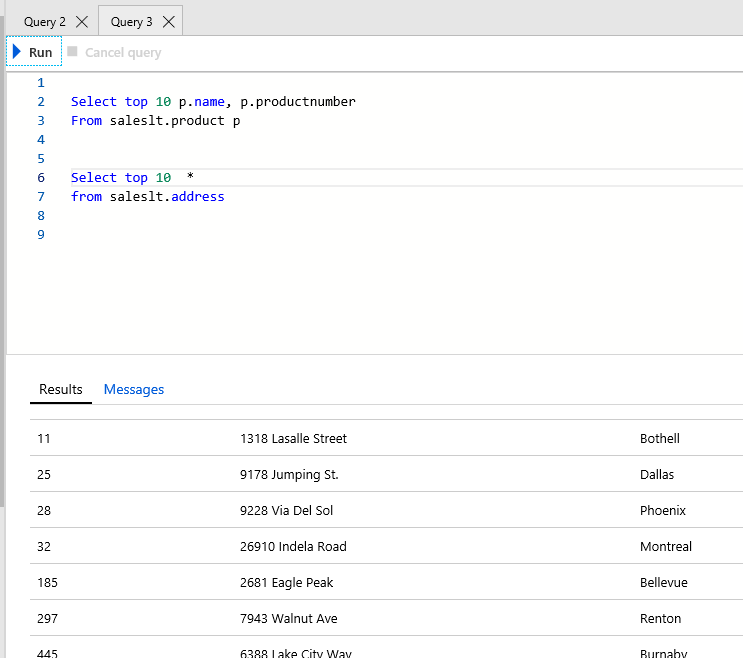 There are tabs across the top, the T-SQL pane, a results pane and a messages pane. 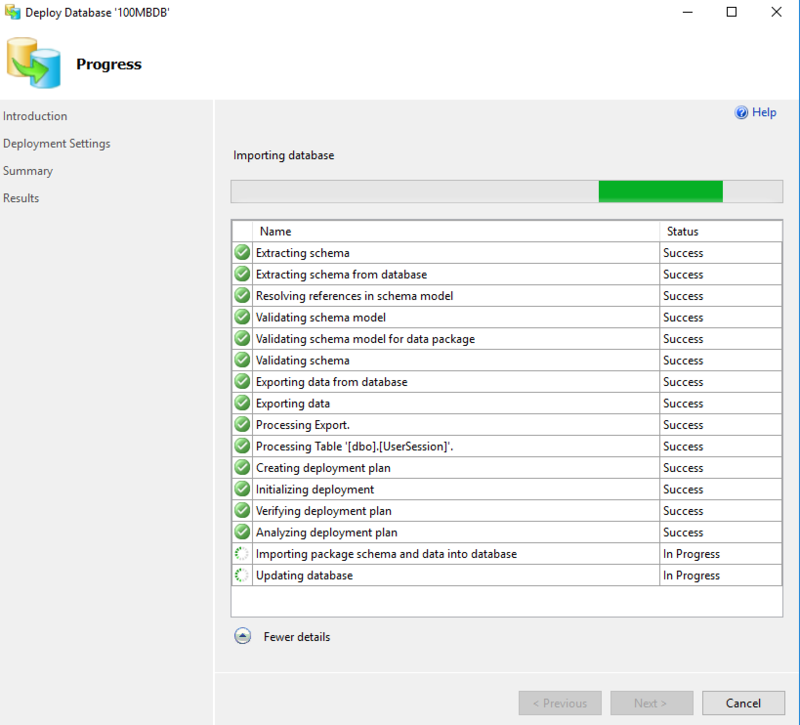 Starting with the T-SQL pane, there is color coding of the SQL, however it is slightly different than that of SSMS. First big difference is that there is not an option to change the size or color of the font. 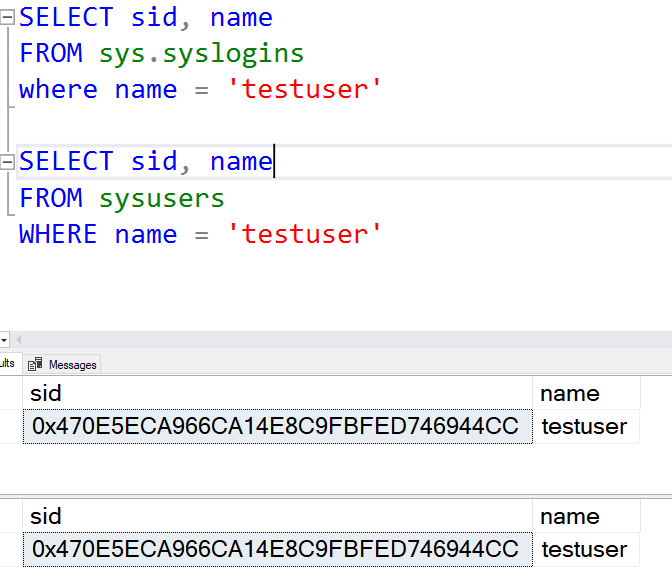 If SSMS if you execute two SELECT statements, like the ones below, the results are much different in Azure Query editor when compared to the same two queries in SSMS. Now look what happens when I run the same queries as the Query editor, I only get one data set vs the two when executed in SSMS. In SSMS, if you right click on a table you will see an option to Edit X number of rows. That options is very similar in Azure Query Editor. The way this is done in the portal is to click on a table and then click the “Edit Data (Preview)” button just to the right of the Login button. This will in turn, return the data in a grid that allows for editing data. You can just double click in a cell in the results set. This will change the cell to an editable version. The edit menu has just 5 buttons on it. When you click the new row button, the new row will appear in a different location that if you attempted to enter a new record use the grid results set in SSMS. The big difference here is that the new row will appear at the top of the grid. One option that is important to me is the ability to change the font size. I have NOT found out how to do this in Azure Query editor. When you execute a statement and an error is returned. 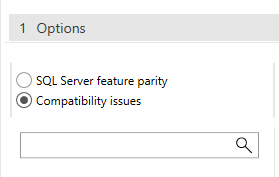 In SSMS this error is red, but default. In the Query editor it is black. There are a number of limitations in the Query editor at this time. Since it is in preview, my hope is the Microsoft will address some of these deficiencies as the Query editor moves closer to having the preview label removed. Despite all of the limitations, I still like it. Once you get used to the limitations it really isn’t that difficult to use. 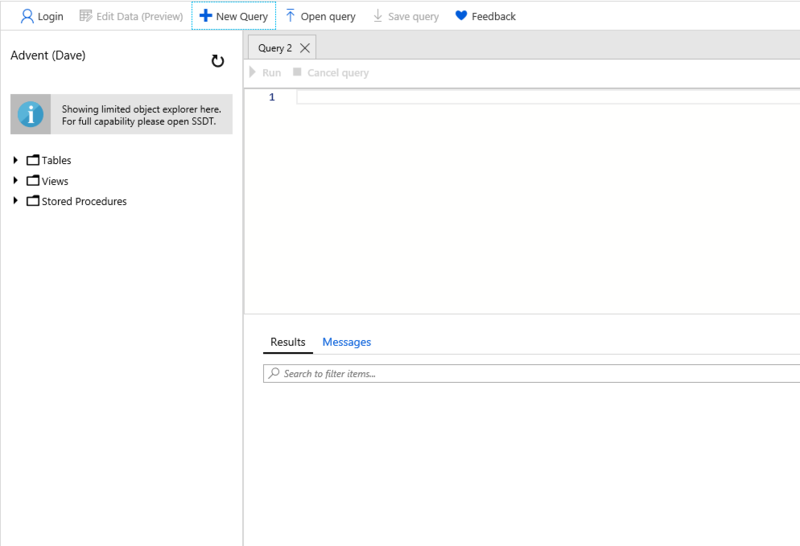 Since the name of the tool is Query Editor, it does make sense that it doesn’t have all the same functionality as SQL Server Management Studio. However, it would be nice to have some the items that are currently not included. Thanks for stopping by and I hope you learned something small. When moving the enterprise to a cloud based solution such as Azure SQL Database, we will need to find a way to migrate existing database to the cloud. 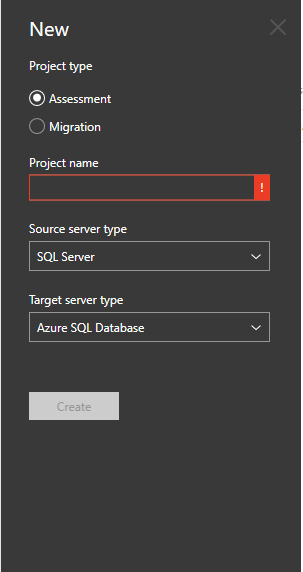 I already completed a post on how to create an Azure SQL database. 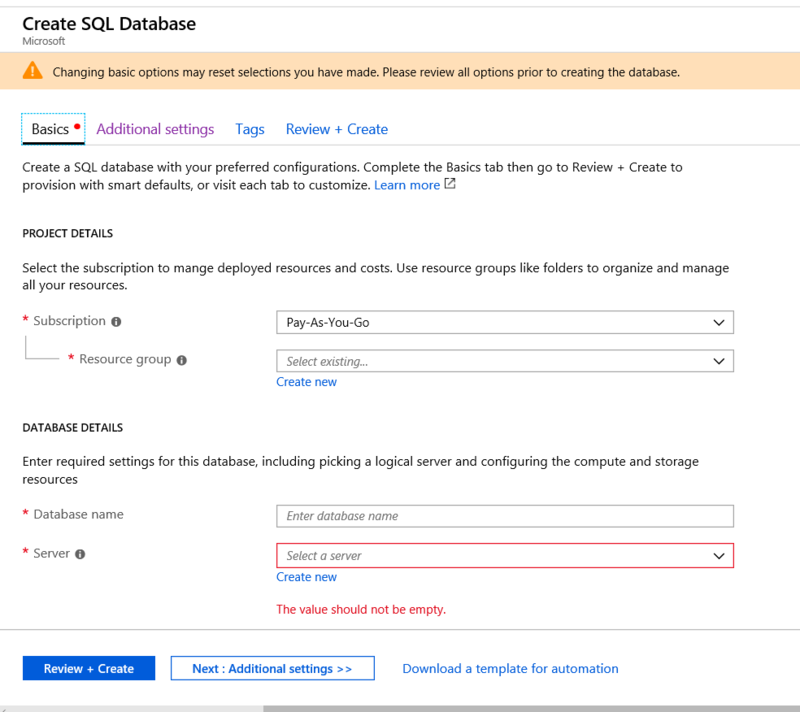 This post will focus more on how to migrate an existing on-prem databases to an Azure SQL Database. 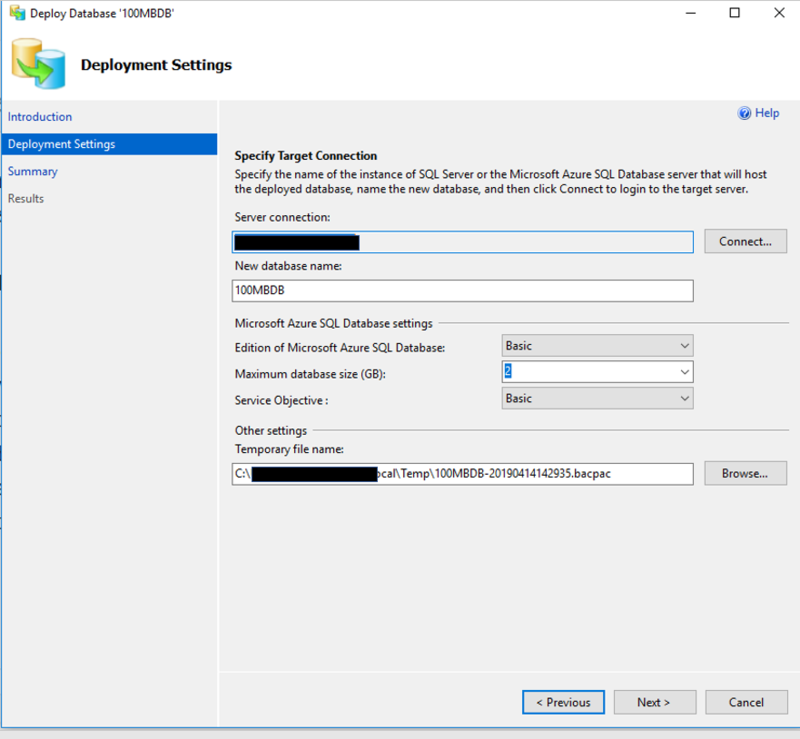 There a several options that you can use, use the “Deploy Database to Microsoft Azure Database…” option in SQL Server Management Studio, Data Migration Assistant tool or use the Azure Database Migration Service. During this post I will cover all three options. After clicking the first next in the wizard, you will then be asked to provide some detailed information about what you are attempting to migrate to Azure SQL Database. Temporary File Name – This is the name and location of the .bacpac file. What is a .bacpac file? Since you may not have worked with this before, I thought I would take a few minutes to go over exactly what a .bacpac file is. It is considered a Data Tier Application that can be used for deploying databases from one location to another. This file will contain both schema, object definitions and data. There is also a .dacpac file type. The only difference between the .bacpac and .dacpac is that the .bacpac is the only file type that also contains the data. This is what the screen will look like. When you click “Next”, you will have an opportunity to review all the settings before clicking “Finish”. When you do, you will see the progress of the migration, step by step. As you can see above, there are number of steps. You can also see that there is a step named “Processing Table”. 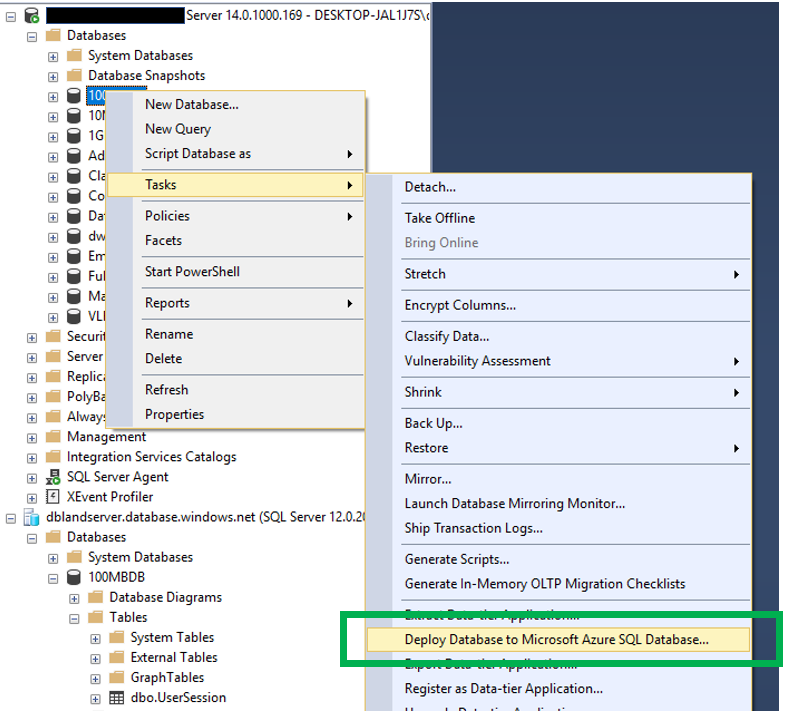 This step will show each table as it is processed and migrated to Azure SQL Database. 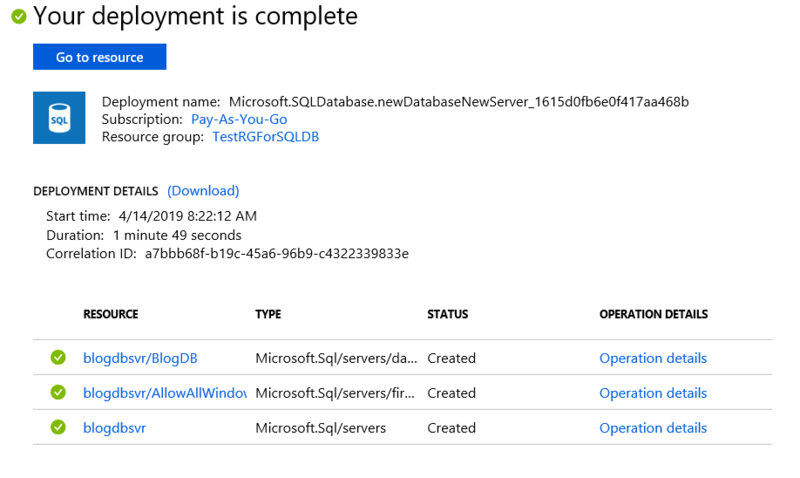 Once the migration is completed, you will now see the database in both locations, the original SQL Server and in Azure SQL Database. This is a relatively easy tool to use. It really has two purposes. 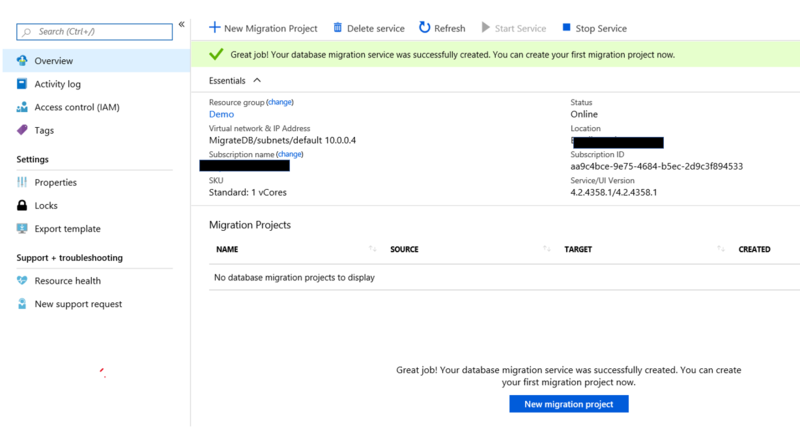 One to assess an on-prem database to identify what challenges you might encounter when migrating at database to Azure and the other to actually complete the migration. This is a tool the must be downloaded and installed before using. To download it you can go here. Download DMA. Once downloaded and installed you will find it list as “Microsoft Data Migration Assistant” in the Start menu, not under the SQL Server items. Below you will see the opening screen in the DMA. As you can see there are two options, completed an assessment or do a migration. By clicking the “+” on the left side you will have an option to chose what you would like to do. Notice that there are also options to restart an assessment or open an assessment. These are exactly what you might think they are. When you complete an assessment you will be able to save the results or save the configurations of the assessment that you can restart if you like. When you click the “+” sign you will then see a few options that you can chose from. Here you will be able to chose to complete an assessment or a migration. Both of which will require a project name, a source and target server type. You will have several options for a target as you can see in the image below. Since this blog post is about the migration of a database, we will focus on that target. Once you pick you source and target, you will then be able to click the “Create” button. Once you did, you will see this. You will see three options, although only two are available at this time. The two options that are available are Check Database Compatibility and Check Feature Parity. Once you click “Next” you will then be asked to identify a source. 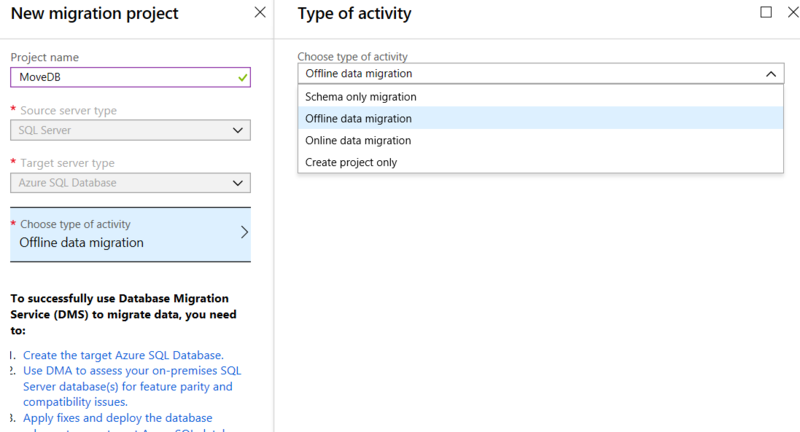 Since this post is about migrating an on-prem SQL Server database to Azure SQL Database, the source will be a local instance of SQL Server. You will have to provide an authentication method and then the database(s) you would like to complete the assessment on. Once you have provided all the information you can click the “Start Assessment” button. Below is an example of the results of the assessment. There were a few things that were expected, especially the Agent jobs not being supported in Azure SQL Database. Fortunately Microsoft has also included links to each of the topics that will allow us to gather more information easily. Make sure you look at both groups of items, SQL Server feature parity and the Compatibility issues. In this case not compatibility issues were found. Now that we have completed an assessment and addressed all the blocking issues, we can now use the same tool to perform the migration. As expected you will also have to provide a project name, a source and a destination type. This will also include the connection information for the target. 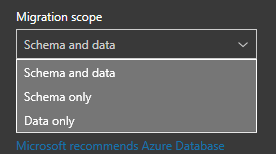 The migration scope has three options. You just need to decide which is best for what you attempting to accomplish. In this case, we will pick Schema and Data. Once you provide all the information, you will be able to click the “Create” button. As part of the migration, there are six steps. These are list in the image below. Selecting a source if the obvious starting point for a migration. Once you do, you will then have an opportunity to pick which database you would like to migrate. 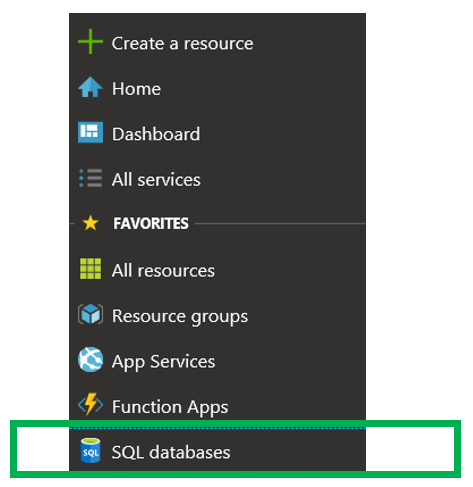 It this is a new database in Azure SQL Database, make sure to click the “Create a new Azure SQL Database…” link. When you do, make sure you click the Connect button so the list of databases refreshes. The next step will allow you to identify which objects you would like to migrate. In this case there are still a few issues that will need to be address, most due to encryption, so I will not migrate those objects. The next step is to generate the scripts. Once the scripts are generated, you can save it or copy it. Note below you the DMA tool will also identify items with assessment issues. At this point the database has been created in Azure SQL Database and all the objects have been created. However, we have not reached the point of migrating the data yet. 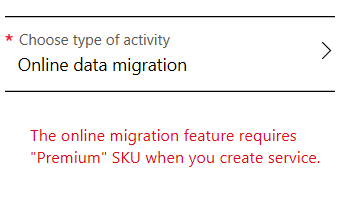 In order to migrate that data, all we have to do is click the “Migrate Data” button. We will now have the option to decide which tables we would like to have the data migrated as well. As you can see below, we can see the tables listed. This list include the number of rows and whether or not the table is ready to move or not. Once you have confirmed the information, click the “Start Data Migration” button. What I like about this part of the tool is that it tells me the progress of each table and the status of each migration of data. Now were are done. Not only have the objects been migrated, but the data as well. 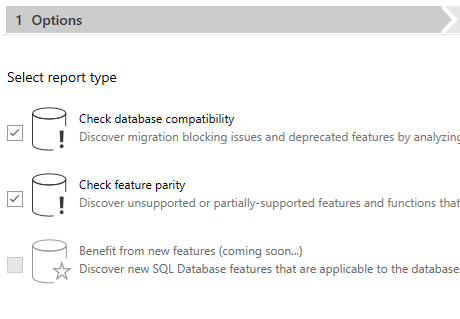 Both of these migration options take place on your computer, one with SSMS and the other the downloadable Data Migration Assistance. In my opinion, I think they are both pretty easy to work with. The third option is done in the Azure portal. There is a server called Azure Data Migration Service. There are a number of required steps to utilize this service. As the name implies, this is a service in the Azure Portal. 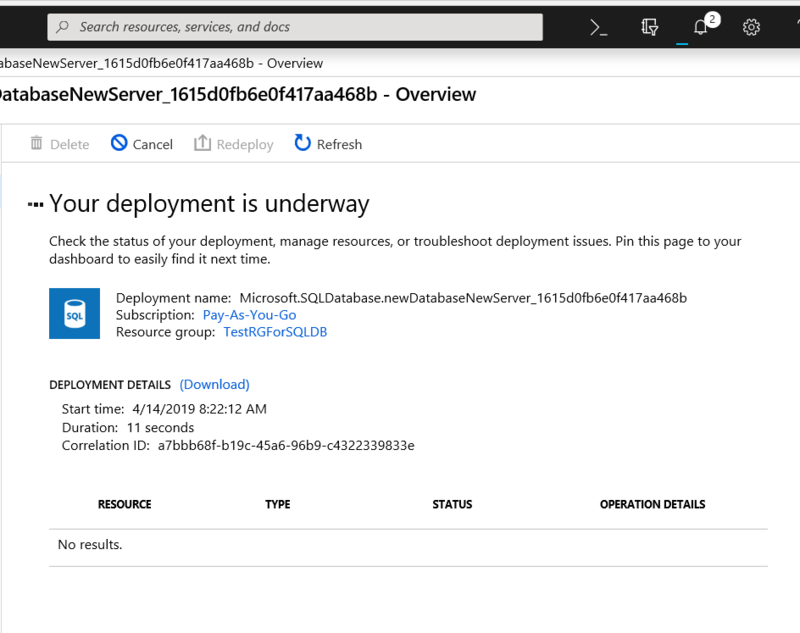 When looking at all the services, the Azure Database Migration Services can be found either by doing a search or looking in the Databases group. 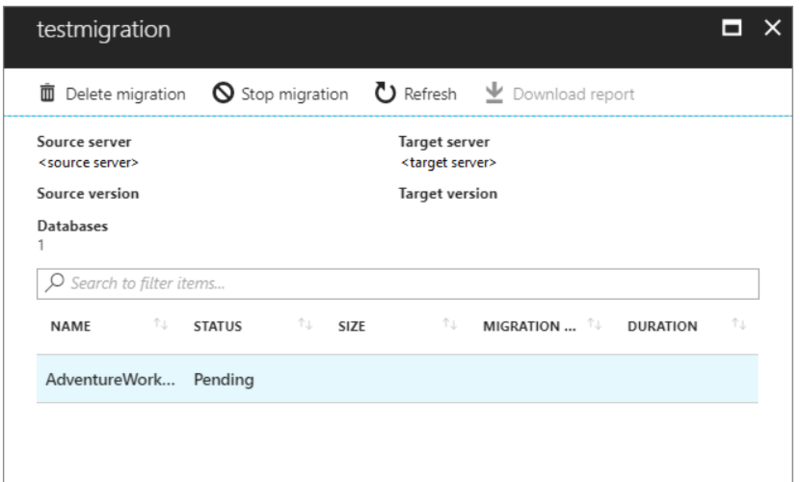 Once you click the Azure Database Migration Service, you will see what is below. However, if you already have one of this service type running, you will not have to go through this step again. For this method, you will need to provide a service name, a location(region) as well as a Virtual Network. Yes, you will need to create a virtual network. This will include the creation of a virtual NIC. If you already have the service created you can go to the All Resources list in the portal and click that service. Once you do, you will see this. The next step is to click the “New Migration Project” button. At this point you will pick a data source and a target. Offline data Migration – this is to be used for source databases that will NOT be changed during the migration. If you chose the Online Data Migration type, Azure with provide you with a list of rules that must be followed in order for the migration to be successful. Also, if you chose Online Data Migration, it will require a higher level of SKU. You must have Premium, which I currently do not have. I received this warning what I tried to use Online Data Migration. Given this I changed the type of activity to Offline Data Migration. You will have to complete several steps to be successful in the migration. These steps are fairly basic and expected. 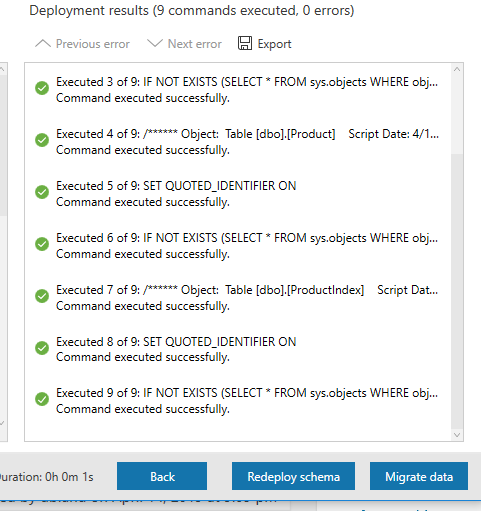 Identify a source, a target, map to target database, configure migration options and a summary. There are a number of network and security steps that must be completed prior to utilizing this service. This is a good description of what is required, click here. As expected the source and the target require the usual information. What is a bit different is the third step, mapping target databases. Below is a screenshot of the mapping step that is on the above Microsoft site. 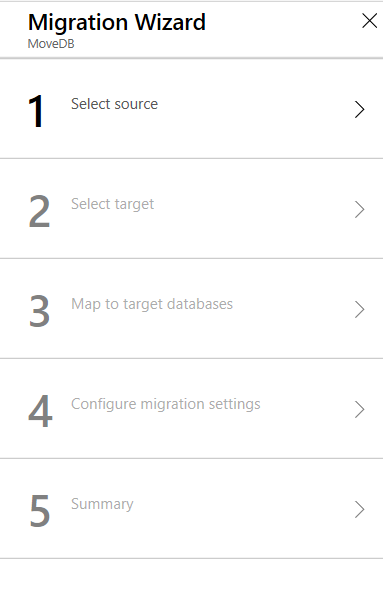 As you can see below, you simple map the source databases that you would like to migrate to a destination database in your Azure SQL database portal. The settings step is simple telling the service what tables you would like to migrate. Below is also from Microsoft’s site. Finally, once you have provided all the required information and you can then begin the migration. Once you do, Azure will provide progress status that will look like this, also from Microsoft’s site. It is always good to have options. In this case we have three different options. Two you can run from your computer and one that must be done in the Azure portal. Personally, I like the options of running the migration through an on-prem computer. They appear to be less involved and I don’t need to involve other teams, such as the network or security team. 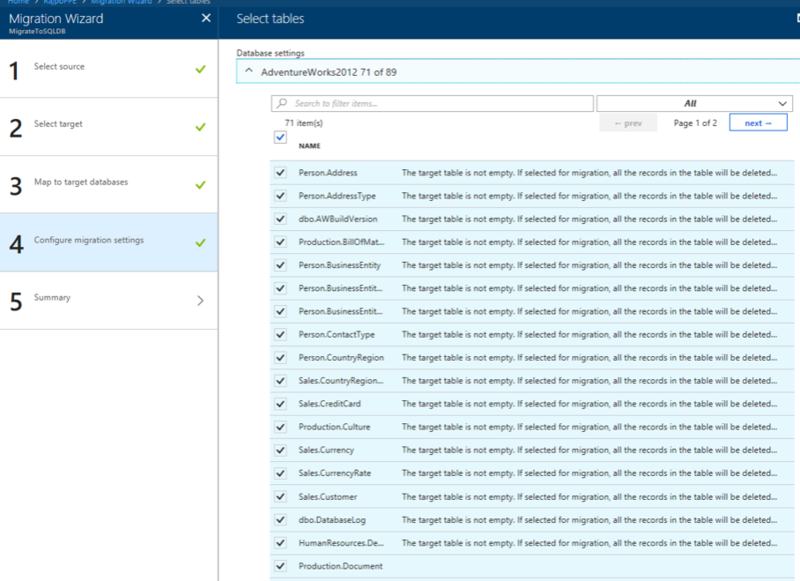 When migrating databases to Azure SQL Database, it is important to complete an assessment on the database first using the Data Migration Assistant. This will allow you to identify what your obstacles might be. You can then address them before starting the migration. Thank for stopping by my blog and I hope you learned something. 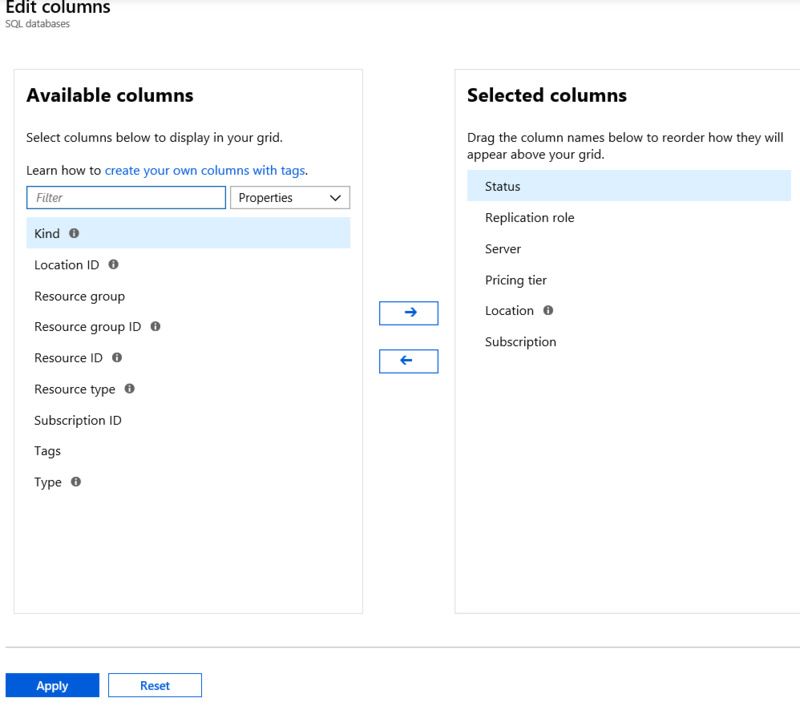 As the industry moves more and more activity to the cloud, I thought it would be a good idea to put together a post on how to create an Azure SQL database. There are a ton of advantages to using an Azure SQL database. One of the biggest is that I do not have to purchase a SQL Server license for a single database. This is my first post on any Azure product. I am hoping to have more in the future. First of all, lets go over what Azure is. Azure is a collection of many different cloud based technologies that Microsoft offers. 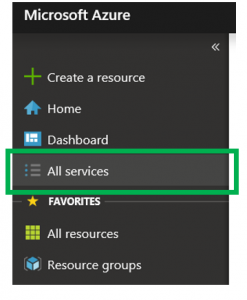 To see the services that are being offered, once in your Azure portal just click the “All Services” option on the left side. This will bring up many, if not all the services that you can utilize. Just remember to be careful to not do more than needed on a production server. It is very easy to take advantage of many of the great features of Azure. If you don’t monitor the cost, you could potentially have a very large bill at the end of the month. Once you click on the services option you will see something similar to what you see below. The red rectangle identifies where the SEARCH options can be found in Azure. The green box is where the groups of services can be found, while the blue box represents the service. There are many services to choose from. You just need to identify what you need to pick the appropriate services. 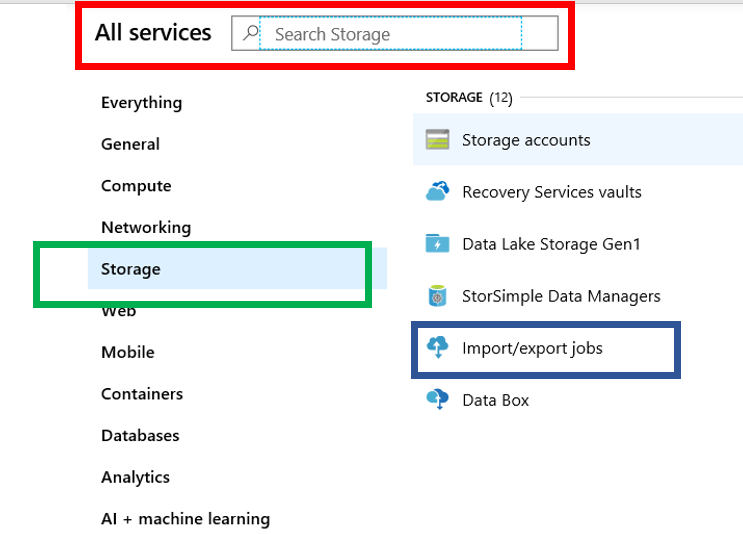 When searching the services you can enter a value into the Search box and Azure will search as you type. If you select a group on the left and then do a search, it will only search that group. However, when you do searching in a group and the query returns no results and there a items in other categories you will see this message. This is simply telling you that there is nothing in the current category that matches your search criteria, how ever there are other services that do. Since this post is about Azure SQL Database, we will focus on that service. There are several ways to get to the point of creating a database, this is one of them. The blue box below is the group of services and the green box is the service, in this case, SQL databases. 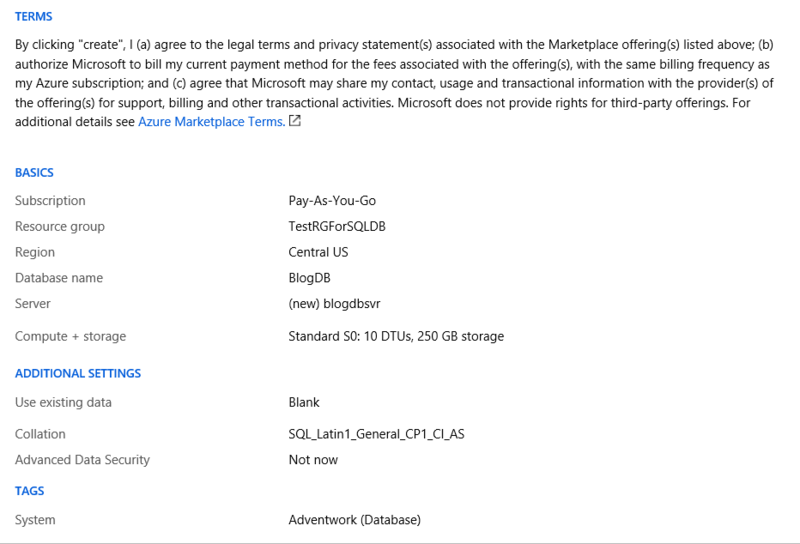 Microsoft defines “SQL Database” as “Azure SQL Database is a general-purpose relational database-as-a-service (DBaaS) based on the latest stable version of Microsoft SQL Server Database Engine“. 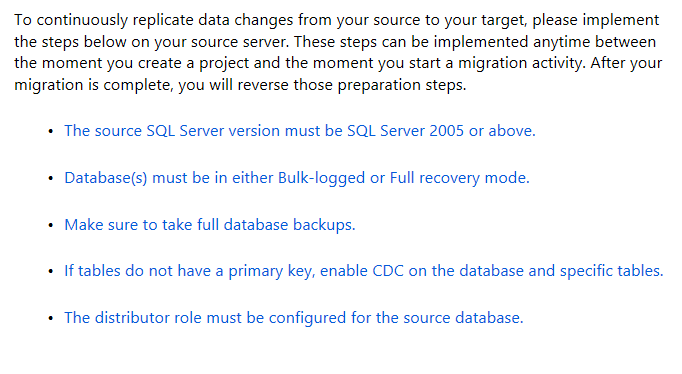 Notice that the definition states that it is based on the latest stable version of SQL Server. This means no SQL Server upgrades or patches, Microsoft takes care of those. 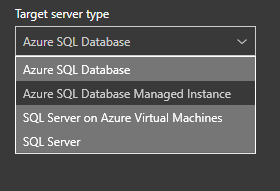 Once you click on “SQL Databases” Azure will take you to this page. If there already SQL Databases, you will see them listed here. Before we move on, I would also like to point out that there are several methods to reach this page. Most notably is by using the menu item on the left. 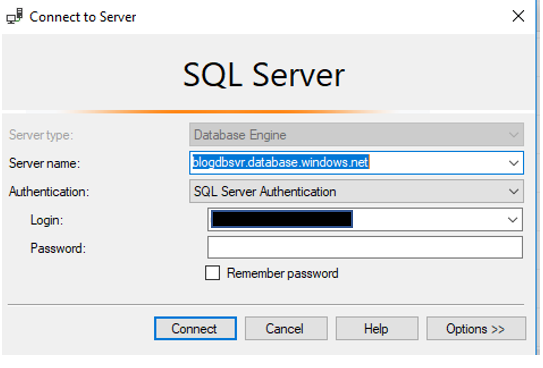 Then you will need to create the database, you can click the “SQL Databases” option. This will take you to the part of the portal that will allow you to create a database, as you see in the image above. Let’s take a tour of what we are seeing. Your interface should look like below. This first thing I would like to point out is the Subscription. Below you can see that the name of the subscription I am using is Pay-As-You-Go. This is the default name you will see when you first create the subscription. You can rename it if you like. Be cautious when adding items to Azure, if you are not careful, you could end up with an unexpectedly large bill. Just be aware of the potential cost before creating items in Azure. You also have the ability to change the columns that you see in the list. You simple click “Edit Columns”. You can also click “Refresh” to see new items if they do not appear. Once you click “Edit Column” you will see the form below. This is very similar to most products that have the ability to change the columns in a list. As you can see below you can move columns back and forth. The list will identify all the SQL databases you currently have in the subscription. As you can see, I currently do not have any databases. Before going into how to create an Azure SQL Database, I thought I would take a moment to talk about what a Region is. A region is nothing more than a geographic location of where you want you resources to reside. It is also important to note that not all services are available in all regions. 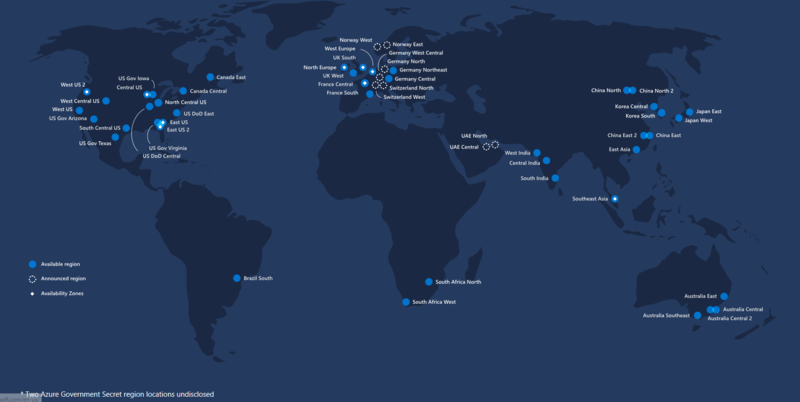 Here is the link to Microsoft’s page on Regions. Ideally you would like to have the resources in the closest region. As part of the database creation process, you will need to place a few resources in regions. Now that we have gone over how to get to the point where we can create a database, let’s create one. When you first click the “Create Database” button you will see this. The first bit of information you will need is which subscription you will be adding the database to. In my case, I just have the one so Azure has defaulted to that one. The next item is the Resource Group. Let’s take a moment to get to know exactly what a resource group is. A resource can only exist in one Resource Group. The link above to Microsoft has the rules listed. Now that we have gone over regions and Resource Groups, it is time to create the database. The first thing we need to do it give the database a name. 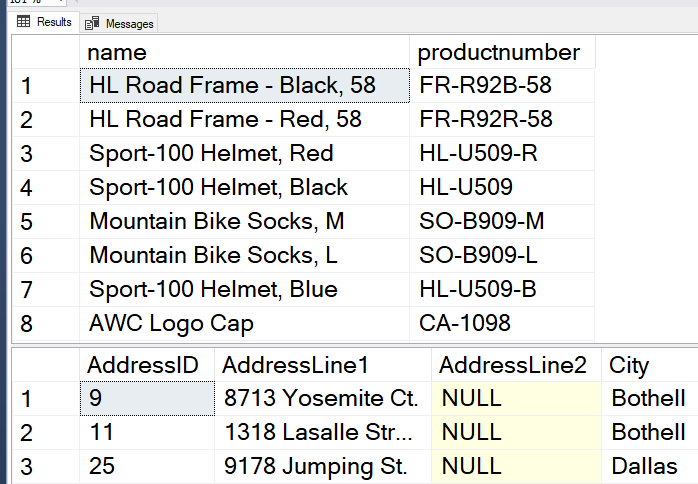 Just as in an On-Prem SQL Server, there are rules around how you name your database. What is nice is that Azure will pop up and tell you if you are violating one of the rules. Just as with an On-Prem instance, the rules are pretty straight forward. If you violate one of the rules, Azure will tell you. Just as seen below. Now that we have provided a name for the database, the next step is to assign it to a server. If you have not created a server yet, you can simply click the “Create New” link. A server for Azure SQL Database is a logical container for your SQL Databases and provides a centralized point for administration. Here is a link to Microsoft’s documentation on Server. When creating a server, you will also need to create an account that will be used as the administrator account. You will also need to provide a password and a region. When providing a name, the name cannot be the same as the database. Notice that under the server name, you will see, “.database.windows.net”. 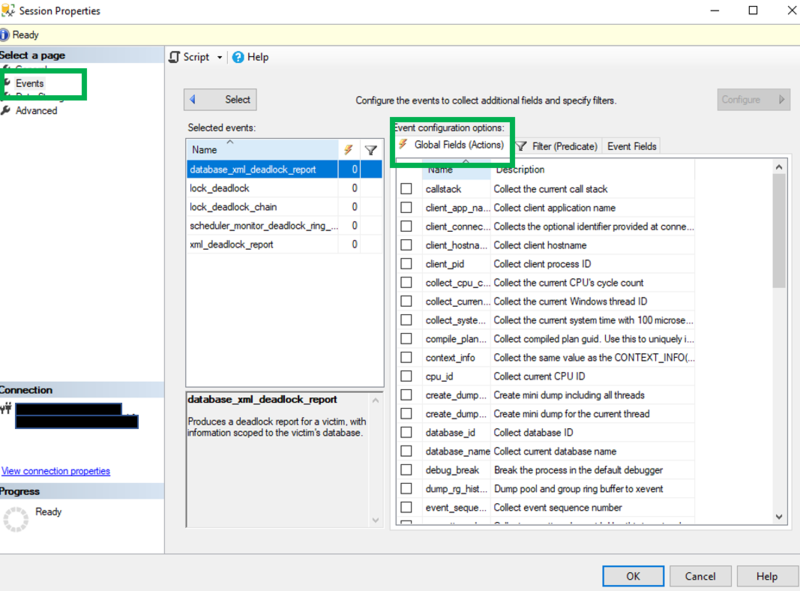 This will be important information you will need when connecting to your database with SQL Server Management Studio. Once you have click the “Select” button and filled out all the information, it may look like you are done, but you are not. We need to provide additional information. By clicking on the “Additional Setting” item towards the bottom we will see the what else we need to provide. The first item we need to address is the Data Source. Here you have three options. There is only one option at this point for the sample database, AdventureWorksLT. If you chose None, this is simply a blank database and you will need to review the Collation to see if it appropriate for your needs. The next item you will look to look at are the tags. Tags are not required, but can be useful when grouping your databases. For example, if you have a system that uses more than one database, you can take them with the name of the system. Just a note, keep in mind cross database queries are not allowed in Azure SQL Database. Now that we have provided all the required information it is time to review before creating the database. You will want to pay close attention to the Product Details section. Notice that it has an estimated cost per month. The rest of the options are pretty straight forward, however should be carefully be reviewed before creating the database. Once you click “Create” you will see this. If you look in the upper right corner of the image, you will see something that looks kind of like a bell. This is the notifications and you will see the blue line under it move from the left to the right while the deployment is in progress. Once the deployment is complete, Azure will tell you as seen below. Now that we have created the database, we can confirm it by returning to the list we talked about earlier. Just click the SQL Database menu item on the left and you will be returned here. Notice that our new database is listed. I would also like to point out the Tags. You will see this list along the top. If you click the drop down arrow you will see this and the tags that was created. By clicking the box next to Adventwork, the list will only show items that have a tag of Adventwork. 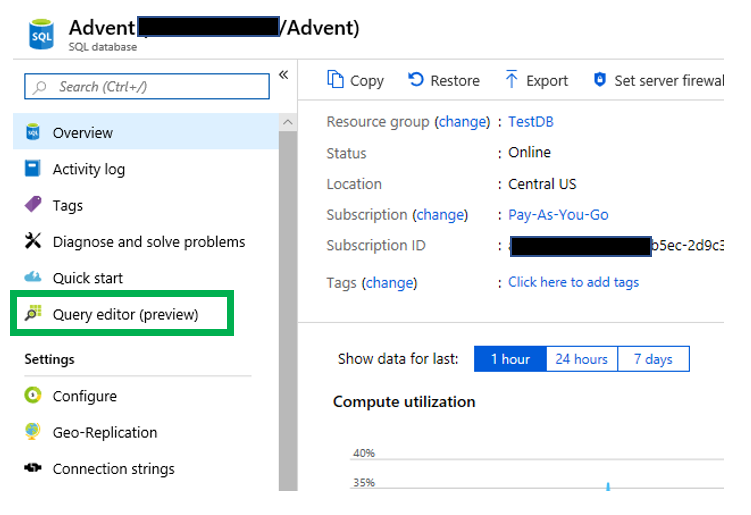 Although this post was mostly about how to create an Azure SQL Database, I would also like to go over how to connect to your newly created database. If you click the database name in the list, you will be taken to a page that will list all the important information about your database. This includes the subscription name, database name, status, location as well as a number of other usefully bits of information. However, in order to connect there is one thing we need to copy, that is the Server Name. In my case, blogdbsvr.database.windows.net. If you move your mouse just to the right of it, you will be able to copy it to the clipboard. Once on the clipboard, it is time to open SSMS. 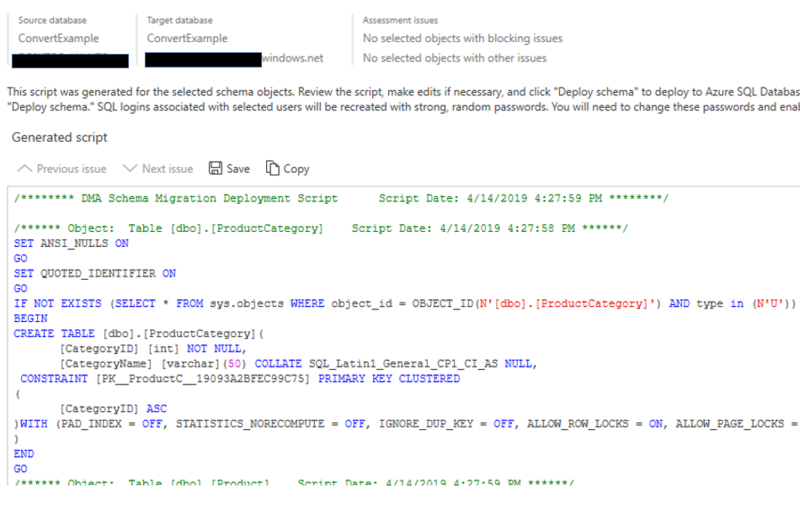 You will connect just as if you were connecting to an On-Prem SQL Server using SQL Authentication. Once you enter a user name and password, you click Connect. This is where you will begin to see a few differences. You will be asked to login into your Azure account as well as a few screens about your IP address. Once connected you will see a few significant differences from an On-Prem instance of SQL Server. 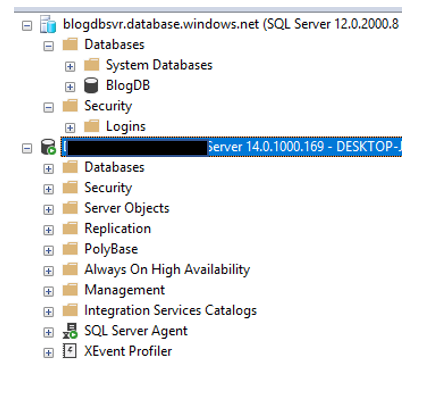 Notice that the SQL Server agent is no longer present. As a DBA, this is a huge difference because so much of our on going maintenance is dependent on the Agent. No worries there, Microsoft has provide a number of ways for us to schedule maintenance jobs. Below you will see many more differences. Listing all the differences is outside the purpose of the post, however there is a lot of really good information available. I may cover some of these differences in future blog posts. 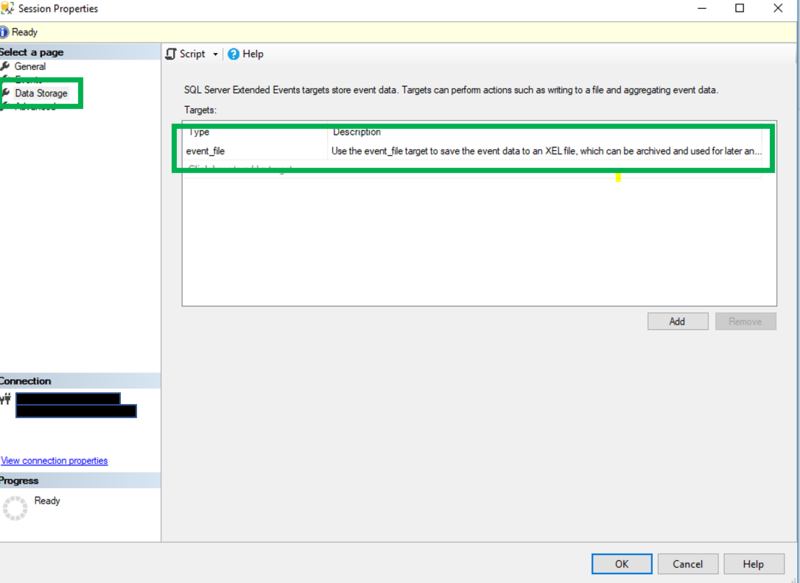 Once you are in SSMS, you can do many of the same things you have done with an on-prem instance. Including creating objects, writing queries and working with security. Please keep in mind that there are some differences on how security is set up, however that is for another time. Thanks for reading the long post on how to create an Azure SQL Database. This is the longest blog post I have done so far. Hopefully you found it useful. After a brief break, ok..maybe not so brief, this post continues the series of the Anatomy of a Select statement. This post is about the WHERE clause. The WHERE clause will provide a filter to limit the rows returned to only the rows that are needed. As we should always do, it is important to only pull the data that is needed. The WHERE clause is a key part of that effort. We use the SELECT to limit the columns, while the WHERE is one of the statements that can limit the number of rows. The sample code will be at the end of this blog post. The first thing we should look at is exactly where does the WHERE go? As indicated below, it follows immediately after the FROM. Since the FROM is the first part processed, the WHERE is the second clause processed. When utilizing the WHERE clause, you will also need to create an expression that will be used as a comparison for limiting the rows returned. How this expression looks will depend on the data type you are comparing. Although there are many data types, you will see a few fare more frequently then others. These will include the string based data types like VARCHAR and CHAR, the DateTime related data types and numeric data types. This expression can be a number of things. First of all it can be a simple value you are attempting to compare. In the statement below you will see after the WHERE clause, there is a column name, a comparison operator and a comparison value. In the statement below we are comparing the SalesOrderID column values to the number 4. The expression must evaluate to TRUE or FALSE. If it evaluates to TRUE, those records are returned. Of course the means that if the expression evaluates to FLASE that row will not be included in the result set. When comparing a character based data type such as VARCHAR, you of course must include the single quotes. We will talk about wild card searches later in this post. In this case the column name is LastName, the comparison operator is the equal sign(=) and the value to be compared is ‘Smith’. We have a number of options when deciding on what comparison operator to use. This list includes, but not limited to, the list below. Many times we will have to complete more than one comparison to capture the rows we are looking for. When you look below you will see that this WHERE clause is looking for anyone that has the LastName of Smith and the StateOfBirth is WI. You can also use the keyword OR rather than AND. In the statement below, All the records with a last name of Smith will be returned. In addition, all records that have the StateOfBirth of WI. An example would be if I have a last name of Smith, but I was born in New York, I would be returned in the results because I have the last name of Smith, even if the StateOfBirth is Ohio. The WHERE clause also supports the use of the IN keyword. This can be used if there a multiple values in the date set that I would like to see. In this case, all records that have the last name of Smith, Jackson or Denault will be returned in the result set. As you can see, this also works with numeric data types. The above statement can also be written using Less Than or Equal to comparison operator. Just as you can search for values that are equal to something, you can also search for something that is not equal to. How you do this depends on if you are excluding a single value or a list of values. If you are comparing a single value, you simply use this, <>. This also works for character based data types as well. The statement below will return all records that have a LastName of something other than Smith. As mentioned before there are a number of ways to pull data from a table and limit the number of rows using the WHERE clause. There is another option I would like to mention. Although it may not be the best option, using a sub-query is indeed an option. A sub-query is nothing more that a query in the SELECT statement. If you look at the above statement, the sub-query is in green. This will work just fine. If the sub-query returns more than on row, it will still work because of the use of the IN keyword. However, if I were to change the IN keyword to an equal sign, it will fail. You will see this error. The reason it is failing is because the equal sign expects just a single value, while we passed in a number of values. Sometimes when we are searching for something, we don’t know enough details about the value we are looking for. This is where the wildcard searches come in to play. There are a number of options where using a wildcard search, we will just focus on the use of the % character. This the same as searching with an * to search for a file, like *.docx. The statement below will return any state that starts with the word New. This statement will return anything that starts with New and ends with the letter K.
The code below will return any state that has the work new in it. Notice that the percent sign is also at the front of the value. While all wildcard searches may not be the best performing, when placing the % at the beginning of the value, this will force a scan rather than a seek. This is a potential performance problem and should be used with caution. Notice that these statements use the LIKE keyword. If you use a wildcard search with the %, you must use the key word LIKE. If you do not, SQL Server will process the string of ‘%new%’ as a literal and look for the word new and having the % both at the beginning and at the end. It will not be processed as a wildcard. These examples will work with the AdventureWorks2014 sample database. Although it could work on a newer version of the database, I just haven’t tested it. –This well return all records have a Name starting with Blade. –This well return all records have the word name in the product name somewhere. –This well return all records have the a name that starts with the letter A and ends with the letter r.
This may conclude my series on the Anatomy of a Select statement. During this series of posts, I covered the processing order, SELECT, FROM, WHERE, GROUP BY\HAVING and ORDER BY. Thanks for visiting my blog..I really hope you learned something as you read it! Today I received an email from someone who attended my Extended Event session on Boston last fall. He was asking what table stores information about what Extended Events exist on the server. The answer is sys.dm_xe_objects data management view. In this DMV, obviously there are a number of columns. This post will focus mostly on the object_type column. This column has a number of potential values, including Event, Target and Action. When setting up a SQL Server Extended Event session these are a few of the key items that need to be filled out. Let’s just take a few moments to identify what these are. Target – This is where the data captured by the Extended Event session will be stored. Many times you will find the target to be the event_file target, although from time to time you will find the data going to other targets. The data will be stored in an XML format. See the image below. Actions – These are also referred to as Global Fields. These are the fields that many of the events have in common. You can decide what data you would like to collect. These differ from the Event Fields in the sense that are shared with all the events. Event Fields are data points that are specific to that event. Sometimes you will find a particular data point in both the Actions and Event Fields. Events – This is the focus of this post. Events are things that happen on the server and you would like to capture the what, when and other information about the event. As each release of SQL Server comes out, there are more and more events included. The image below is an example of some of the events you might want to use. In this case they are related to Deadlocks. Now back to the purpose of this post, where is this information found in the system tables. As stated above, the information can be found in the sys.dm_xe_objects DMV. 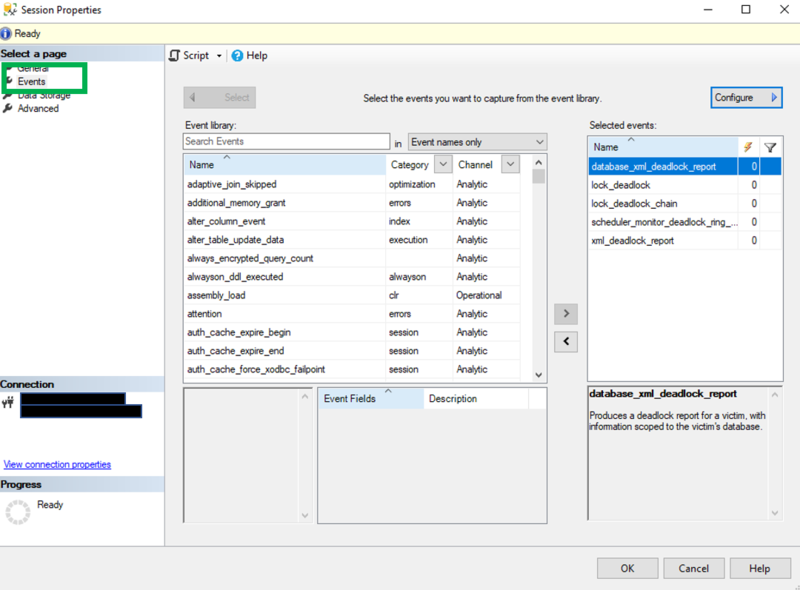 If you run this query you will see all the events for that instance. When I run this on my SQL Server 2017 server I get 1,505 events. Although, your results might be slightly different depending on version. Here what the data set looks like. There are really two columns that are important for this post, the Name and Description columns. Thank you for stopping by and a big thank you to the attendee that emailed me the question. Dm_os_performance_counters is a great Data Management View that I use quite often. You can find a ton of information that can help you identify performance bottlenecks in your system. It can be used to view Page Life Expectancy, Free list stalls/sec, Lazy writes/sec, Batch Requests/sec, SQL Compilations/sec, SQL Re-Compilations/sec, Cursor Requests/sec, Checkpoint pages/sec as well many other key data points. All of which can play a role in the effective identification of performance bottlenecks. First of all, let’s cover a bit of background on this DMV. It has been around since SQL Server 2008 and will work in Azure SQL Database as well as Azure SQL Data Warehouse. Although in the Azure SQL Data Warehouse it has a slightly different name, sys.dm_pdw_nodes_os_performance_counters. The use of the DMV requires view server state permissions. There are a number of columns that are important, object_name and counter_name are just a couple. There is a column named cntr_type column. This is the column that will help us identify the type of each counter. There are five counter types, although we will only discuss two of them here. You can find more information on the other types here, link. The first one has a counter type value of 27269576. This counter type is cumulative since the last time the SQL Server service was started. An example of this type of counter is Batch Request/sec. The other counter type have a value of 65792. This counter type is the value as it stands right now. An example of this is Page Life Expectancy, which changes constantly as normal activity takes place on the server. This post focuses on the counter type that is cumulative. The challenge that this counter type presents is that although it may be a value greater than 0, it is something that may not be happening at this point in time. This is what we need to determine, is this still happening or did it happen in the past. Free List Stalls/sec is an example of this counter type. This counter is one of several that can help us determine if there is memory pressure on the server. If the current value is 30,000 and the service was last restarted 3 months ago, we don’t really know when these took place. So what we want to do is determine if they are still happening. This is where the PIVOT can help. If you simply pull from the DMV you will get a single row for many of these types of counters. Even if you use the WAITFOR to capture the value multiple times and place it into a table, it will look something like this. Notice each row is 10 seconds apart. I think this presents a few challenges, the biggest being how can I easily tell if the event is still happening. Another challenge is when you have two counters that should be looked at as a pair, like Batch Requests/sec and SQL Compilations/sec. I want to be able to easily look at the data and see the values as they change over a period of time. I want it to look something like this. The counter names on the left and the times of capture along the top. As you can see, in this example the capture of the data took place every 10 seconds. This can be accomplished by using the PIVOT command. The first thing we do is to declare a counter variable and a table to store the values. Then set the counter variable to 1, although you can set this to 0 if you like. This variable will server as our counter so the WHILE knows when to stop. The next step is to write the code to capture the counter values and insert the data it the temporary table created above. Because we need to capture the values over a period of time, the WAITFOR DELAY is used. In this case the delay is 10 seconds, although you can change this to suit your needs. Of course, don’t forget to increment the counter variable. You will need to determine what counters you would like to capture. Notice in the WHERE clause, we are looking for an instance_name of ” or ‘_total’. This will allow the code to only capture one row for each counter. The number 10 is the number of times we want to capture the counter values. If you want to capture the data more frequently, simpley modify the number of seconds in the WAITFOR DELAY. Here is link to my post in this topic, WAITFOR. 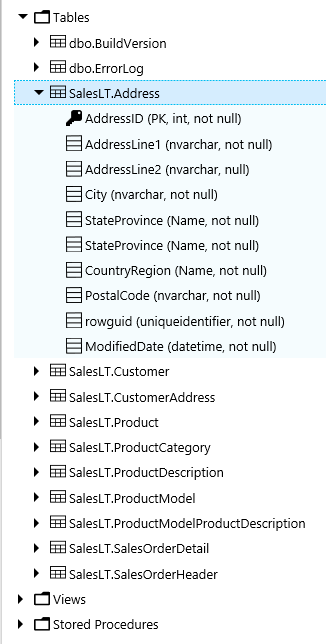 Then we need to declare two variables, one to hold column names and the other to execute the dynamic SQL. Now we can into the meat of the PIVOT. We want to capture the column names from the time of each cycle of data capture above. The above code will allow us to use the time of data capture as column headers as seen below. If you print the @cols variable it will look something like this. You can see a series of dates with times separated with a comma. These values will now become the column names for our final result set. Now that we have our column names, let’s finishing up with the PIVOT. Because the column names are created dynamically, we will need to use Dynamic SQL to complete it. If you use these blocks of code together you will get what I think is the desired result. Notice the times across the top and the counter name on the left. Here is a link to the complete code, PIVOTDMV. Thank you for stopping by my blog and I hope you will find this useful! If you need to see the definition of an object you have several choices. First, you could right click on the object and generate the script. Another option you have is to use sp_helptext. This system stored procedure can be used on any version of SQL Server since 2008, this includes Azure SQL Database and Azure SQL Data Warehouse. This stored procedure can be used to obtain the definition of a number of objects, however it does not work on all object types. The procedure has two parameters, @objname and @columnname. The first parameter, @objname is the name of the object you are seeking to get the definition. The second parameter, which is optional, can be used to get the definition of a computed column. When using the stored procedure you must have the rights to view definitions of objects. We will start with the obvious, the first parameter, the name of the object. There just a few rules regarding this parameter. First of all, the object must exist in the current database. 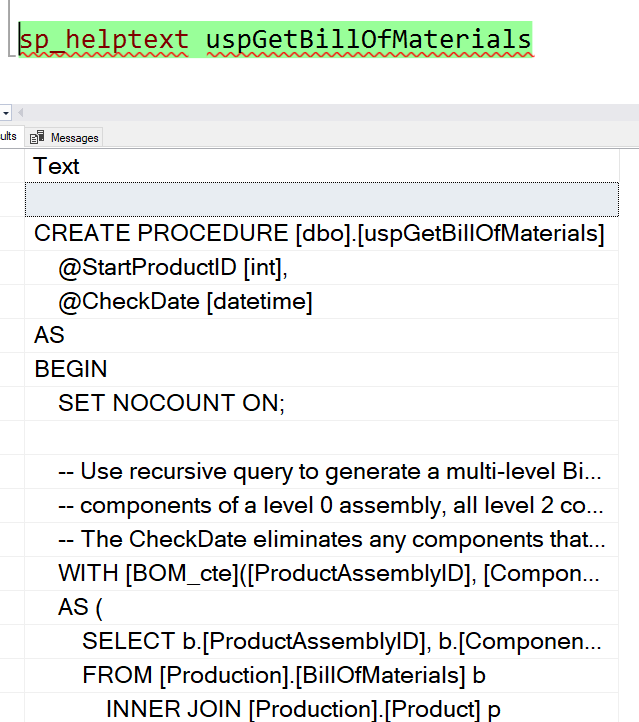 If the object is not in the dbo schema, you will need to include the schema and include single quotes like below. If you include the schema in the object name and do not add the quotes you will get following error. If the object is in the dbo scheme it will look like this, single quotes not needed. Although quotes are not required, it will also not fail if you include them. When you execute the above statement you will get these results. Sometimes it might be nice to see it in the grid, however I find it better to send the results to text instead. It is easier to copy to the clipboard. 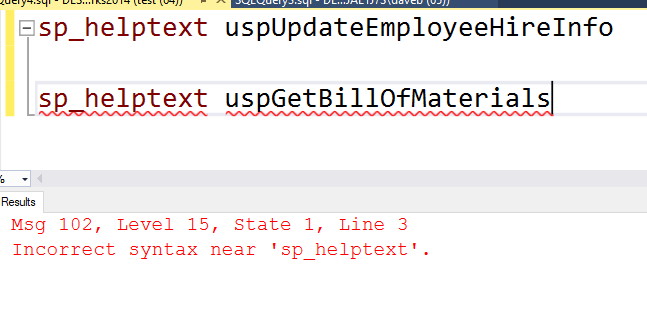 When you send the results to text, SQL Server will add the word text at the top, this is actually the column name of the result set. I really like to use sp_helptext when I have multiple objects that I need script. However, there is a bit of a catch. If you try to run it without the GO keyword between you will receive this error. The second parameter only works on calculated columns. Below you will find the code. Notice that the column name is not in quotes. It will work either way, with or without quotes. Column ‘orderdate’ is not a computed column. Just a few additional comments. Sp_helptext will not work on encrypted objects. This next topic may be in a future blog post, however, I did want to mention there as well. There is another option. This code will return the definition of the uAddress trigger. When you run this, you will see the definition of the trigger. I really do hope you learned a little something, that is why I do this, to help be become better at their jobs.. Thank you for visiting my blog. Trace flags can be used for many things. They can be used to capture information about what is happening. For example trace flags 1204 and 1222 can be used to capture information about deadlocks. 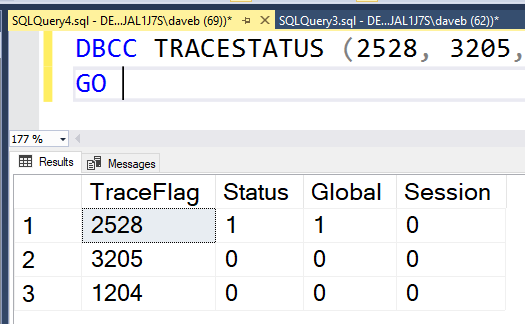 Trace flags can be used to change the behavior of SQL Server for example, trace flag 3226 can be used to suppress successful backup messages in the error log. You can even use trace flags to change the behavior of the TempDB, trace flags 1117 and 1118 can help keep the TempDB files close to the same size by changing how the data files grow. There are many more trace flags that can be used. Here is a link to a Microsoft document that describes each of the trace flags, click here. In order to use trace flags they must be enabled first. The first step would be to determine which flags are currently enabled. This can be done with the DBCC TRACESTATUS statement. If you run this statement to see what trace flags are enabled. 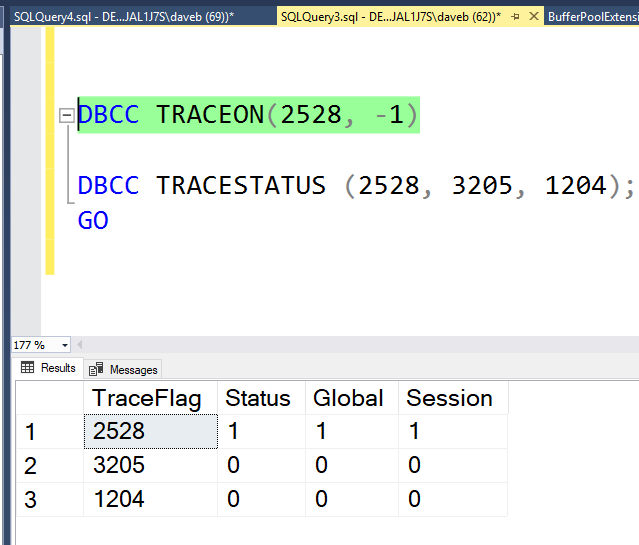 Notice the -1 in the parameter, the value tells SQL Server to return information on all enabled trace flags. You will get one of two results. You will either get the list of trace flags that are enabled or you will get this statement. If you receive the above statement, it means that there are not any trace flags enabled at the moment. However, let’s say I have a number of trace flags enabled and I just want to check the status of one or more specific trace flags, you can use the code below. This statement accepts the trace flags you are looking for in a comma separated list. In in the above statement you will have a set of three rows returned. The results are below. Notice there are 4 columns, the TraceFlag number, status, global and session. The trace flag number is obvious as is the status. In the status column it will either be a 1 or 0, enabled or disabled. This brings us to the point of this post. The third and forth column of the result set, Global and Session. These columns identify if the trace flag is turned on globally or just for the current session. If you run this code the trace flag will be turned on for the session. This can be confirmed by running this. Notice that the value for the 2528 trace flag for Session is set to TRUE. So what does it mean to when a trace flag is turned on just for a session? It means that the trace flag is only active for the current session and is not visible from other sessions. The image below show that 2528 is not active. The trace flag was enable for SPID 62 and can not be seen from session 69. In order to enable the trace flag globally, you will need to make one simple change to the DBCC statement. You simply have to add the -1 to the TRACEON statement as in the above statement. When you run TRACESTATUS again, you will see that the flag under Global has changed to true. This trace flag was enabled for SPID 62. If I run TraceStatus in SPID 69, I see that the session is indeed enabled globally. Notice that trace flag 2528 is not enabled for SPID 69, remember we enabled that only for the session, in this case SPID 62. You may have the question of, what happens when I restart the SQL Server service. The answer is simple, the trace flags will no longer be enabled. If you would like to have the trace flags enabled upon start up, you can add the -T command line startup option for SQLServr.exe. One thing that is important here is for you to assure that the trace flags you would like to have enabled to be enabled again when the service is restarted. Per Microsoft, this is a best practice, link to MS. In this same document, Microsoft recommends that you not run TRACEON while users are connected to the system, otherwise you could see unpredictable behavior. Now let’s say you want to disable the trace flags. To do this you will need to use the TRACEOFF statement, like the one below. Notice the -1 parameter is included when you want to turn the trace off globally. You can also enable and disable multiple trace flags with the same statement. The desired trace flags will need to be listed and separated by a comma. Here is an example of how to enable multiple trace flags at the same and as well as check the status. 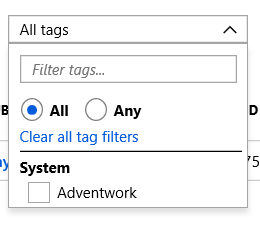 Now comes the challenge, what trace flags should I enable. There are many posts on different blogs that provide many great recommendations. In my opinion, before enabling a trace flag you should thoroughly understand what it does and if there is a potential for a negative impact on performance. Thank you for stopping by my blog and hopefully you learned something. From time to time you might come across this error. But what causes it? It is similar to a type mismatch error in the fact that there is a comparison of two data points that are of different data types they are not compatible. Let’s recreate this error. The code below will create a temp table and then insert a row. The final step will read from the table. Notice that the HireDate column is a Date data type while the comparison in the WHERE clause is comparing the Hiredate column to in TINYINT data type. As you may know, SQL Server will attempt to automatically convert the data to a similar data type using the data type precedence list. From Microsoft, below is the order of the precedence. For example, if SQL Server sees a comparison of a VARCHAR and an INT data type, SQL Server will attempt to convert the VARCHAR to an INT data type because INT is higher in the list. 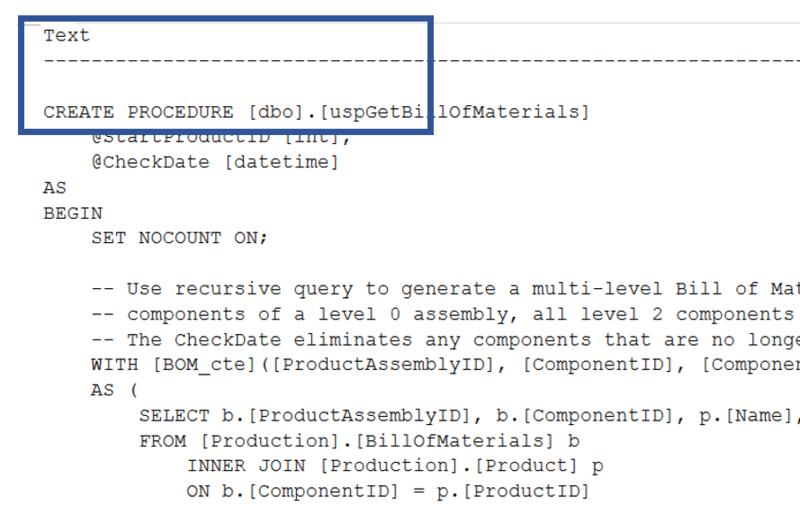 In our example, SQL Server is attempting to convert the TINYINT value of 14 to a DATE data type. Of course, this isn’t possible and the error will be thrown. Now we know what can cause this error, what do we do to fix it? The solution is to address the data type issue. This can be done a number of ways, including using the CONVERT\CAST functions or even changing the data type in the tables. This error can not only happen in SELECT statements, it can will happen on other DML statements as well. If you run this statement against the above temp table, you will get the same error. Hopefully this helps you out a bit and thanks for visiting my blog!